Large boulder with cultural historical value at the foot of Stupeli hillfort, Rite municipality in Jekabpils district. 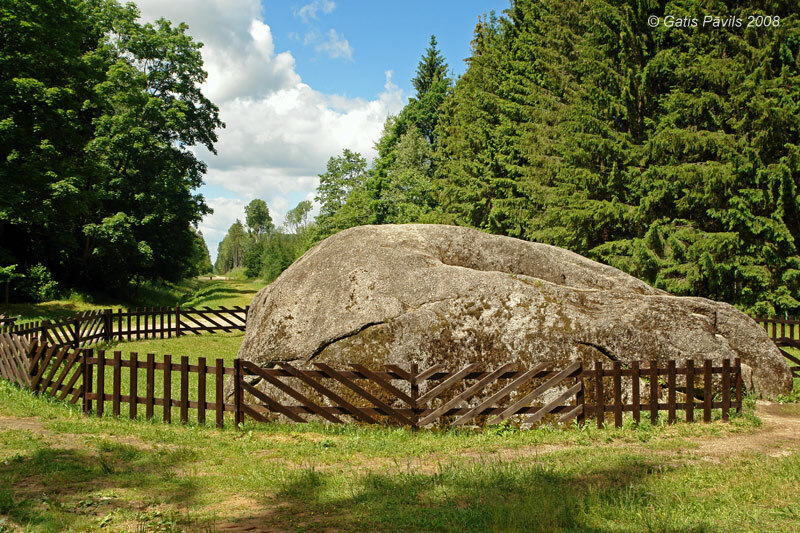 Characteristic geological landmarks for Latvia are large boulders - glacial erratics which once have been separated from the bedrock in the area of contemporary Sweden, Finland, Karelia by glacier and delivered here. In this long way they have been rounded to greater or lesser extent. Sometimes these boulders reach enormous size and thus testify the enormous force of glacier. 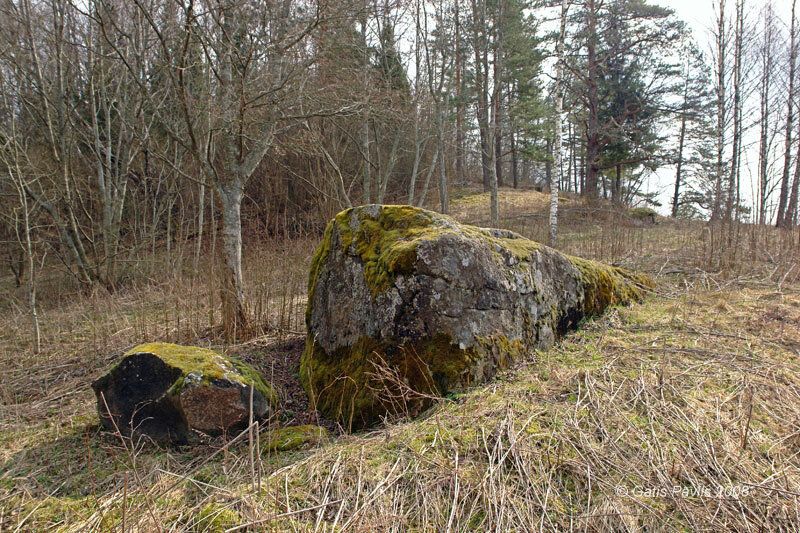 In Lithuania and especially in Estonia there are larger glacial erratics than in Latvia but there still exists a possibility that during some earthworks there will be found enormous boulder. As landmarks in Latvia there could be declared those boulders whose volume exceeds 10 m3 or whose length exceeds 4 metres or height - 2 metres. Such boulders are interesting elements of landscape and often are archaeology and history landmarks - they were noticed in older times and used for manifold religious and health cult rituals, also used as border marks. Often there were hewn cupmarks, crosses and other signs in the surface of those stones. Category does not include those boulders which have split off the cliff and are located at the foot of this cliff - such landmarks are mentioned at the description of respective outcrop or cliff. Major part of large boulders in Latvia consist of granite of different varieties but some have other composition. We can hope that in future there will be performed a more detailed work by geologists in determining the rock composition of large boulders - those stones which have uncommon composition, f.e. monzonites should have lover requirements regarding size. Boulders of unusual form and boulders with glacier striation marks are landmarks as well. Category includes also all those stones which have got historical and archaeological importance. Such landmarks are varied - here should be included all stones with ancient marks - such as cupmarks, larger hollows, crosses, other signs, boulders with cultural layer around them. Category includes those stones which have served as ancient border marks, stones with legends and tales about them, stones with specific names. Part of these landmarks fit in other categories as well - such stones can be worship sites, cemetery architecture landmarks, monuments. 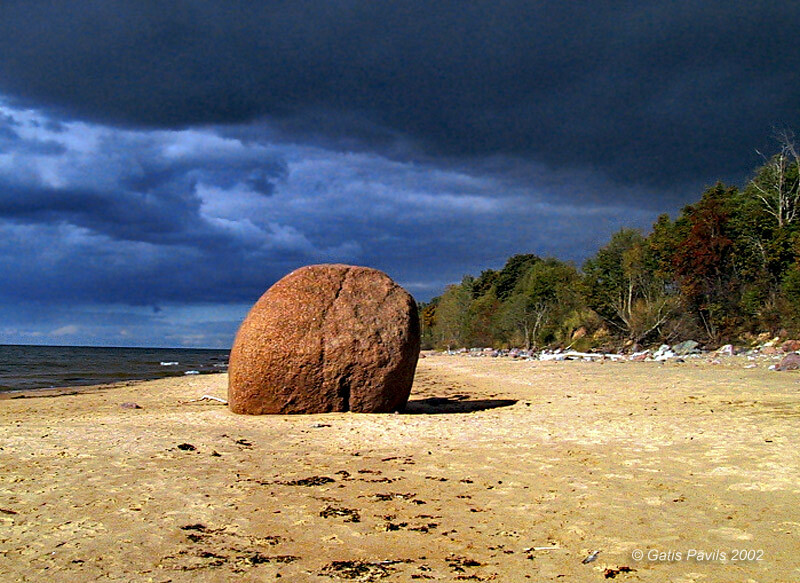 Nicgale Boulder - the largest in Latvia. Radzes Boulder in Brodi quarry, Jekabpils. Second largest known erratic in Latvia, volume exceeds 100 m3. The Big Kraujas Sea Boulder in the sea at Salazgriva rural area, Limbazi district. One of largest boulders in Latvia, major part of the 67 m3 large stone is below the sea level. Seimani Boulder in Cibla region, Ludza district. Most likely major part of this picturesque boulder is below the ground - but the picturesque 50 m3 large part above the soil is 9,5 metres long. Mazirbe Plague Stones in Dundaga municipality, Talsi district. Message left on several stones for future generations by lonesome survivor of numerous wars and epidemics at the beginning of 18th century. Azi Standing Stone in Dundaga municipality, Talsi district. Enormous standing stone - almost for sure this is one of the few megalithic standing stones of Latvia still in original location. Several cup marks in upper side of stone. Beste Mile Stone in Koceni municipality, Valmiera district. Possibly, the only surviving mile stone of postal road from Swedish times. In the surface of stone hewn year "1686" and inscription "14M" - distance in Swedish miles to Riga (140 - 145 km). Perkons Boulder (Thunder's Boulder) in Lielvarde region, Ogre district. This stone weighs 80 tonnes - but nonetheless it has been relocated several times until it arrived in its present picturesque location in the high, steep coast of Daugava. Below are listed all the boulders and stones described in this website. Each column in this table is sortable by alphabet - just click on the header of the table. The first column - "No." - gives an order of appearance of the landmark in this website.